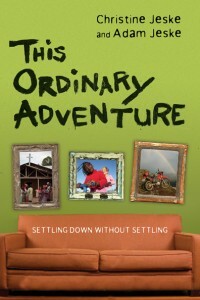 This Ordinary Adventure | Trying to live out Jesus' extraordinary teachings in the midst of the mundane. They started out living the dream. They promised themselves and each other that every day would be an amazing day. They even stuck that phrase–“Amazing Days”–on their refrigerator, like Martin Luther pounding his conviction into a door and launching the next great era of the church. “Ready or not,” they told the world, “here we come.” They traveled the planet, doing missions and community development work in Latin America, China, Africa. Then they went back home–to the land of shopping malls and manicured lawns. And they wondered what had become of their amazing days. In This Ordinary Adventure Adam and Christine Jeske mine their experience, from riding motorcycles in Africa to dicing celery in Wisconsin, in search of a God who is always present and who is charging every moment with potential. Read along and you’ll see your life–your ruts and routines, your frustrations and exhilarations–through different eyes, maybe for the first time. You’ll discover the amazing things God is doing in the shadows of even the most ordinary day.